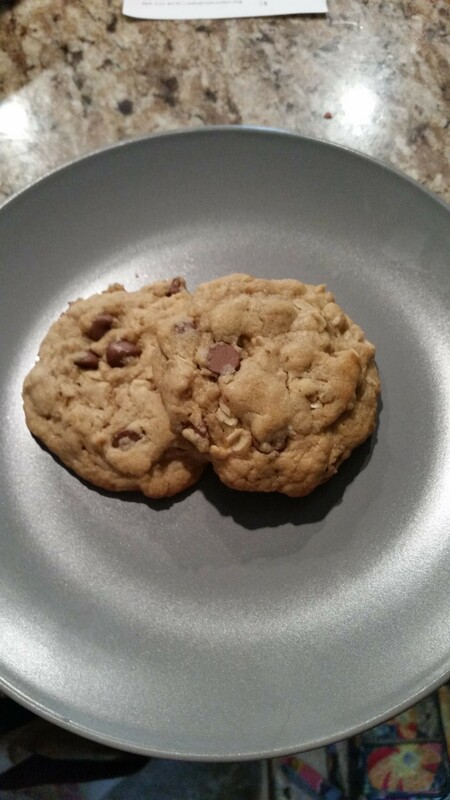 DoubleTree Hotel Like Chocolate Chip Cookies – What's for Dinner Moms? We generally stay at Hilton brand hotels because we travel so much that we can accumulate points towards more hotel stays. One of the hotels we stay at, DoubleTree, has as one of its perks that they give your traveling party free warm chocolate chip cookies when you check in. These cookies are not your traditional chocolate chip cookies. They have a bit of oats in them and a hint of cinnamon. They are also nice and large. They feel like you are really getting something special. My family loved these cookies. They thought they were some of the best cookies I have ever made. The oats were present but didn’t overwhelm and with plenty of milk chocolate chips they had a great flavor. Add a big glass of your favorite milk and grab a cookie and enjoy! In a large bowl mix together oats, flour, baking soda, salt, and cinnamon. In a second bowl mix together melted butter, brown sugar, sugar, and vanilla until well combined. Add two eggs. Stir the butter mixture into the flour mix. Add chocolate chips and walnuts. Stir together. Let dough rest for 1 hour in refrigerator. Scoop by 1/4 cup onto parchment paper. Bake for 10 to 14 minutes. do not over bake. Cookies are best a bit underdone rather than overdone. Love a good homemade chocolate chip cookie over that store junk anytime! Yes! They are soooo much better! Thank you! If you try them I hope you like them! Since I got to taste them in Chicago I can agree: They are awesome! Thanks for analyzing the composition, Marci! I just stayed at a DoubleTree location this weekend hahaha! The first thing I asked for was the free cookie 🙂 Thanks for the recipe! Yes! You are most welcome! Have a great day! Call me nuts, but these look so good I may cry! It looks like chewy cookie perfection (inserting all the heart eye emojis)!! My mouth is watering.. I’m saving this recipe. Yum!!! Yummy! Marci, these looks delicious. Pingback: My Top Three Recipes of the Month – What's for Dinner Moms? I like Hilton chain and I haven’t given thought to accumulate hotel points before, now I will take such stuff more seriously. We do because of the number of times my daughter dances in a year we usually get 2-3 nights fully paid for and a couple of discounted nights.